US - Hog markets seem to be finding a bottom. That’s good news. I just wish the bottom wasn’t quite so low, writes Steve Meyer in the National Hog Farmer. Every futures contract has gained $3 to $5 over the past week and, as you can see in Figure 1 this could well be the high-water mark for hog slaughter this fall. Last week was the high in my forecasts and the 2.400 million head slaughter run was 22,000 or so lower than our forecast. That follows the recent pattern of lower than-expected numbers. 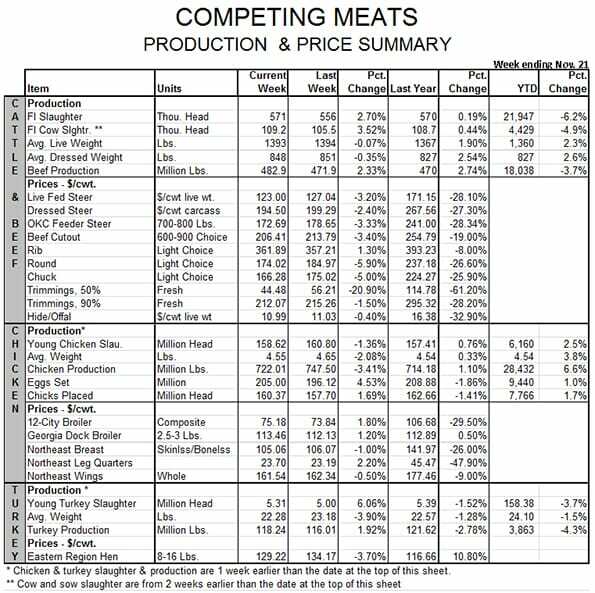 Current market-ready animals are coming generally from the 120-179 pound Sept. 1 inventory. Recall that that figure was over 1% larger than was expected by analysts going into the report and was, indeed, the only figure in that report that was more than 1% different from those expectations. It was also about 1% larger than the corresponding set of lightweight pigs in the June report. 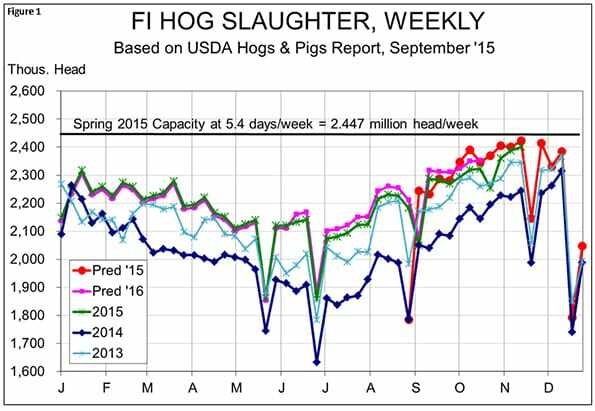 It now appears that the number may have been a bit large as slaughter since the first full week of October has fallen about 2% short of my forecast levels based on those September Hogs and Pigs figures. 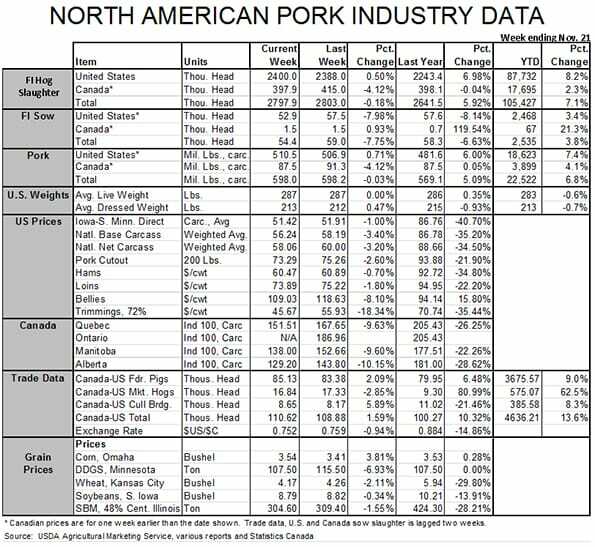 It is possible that we have backed hogs up a bit as weights have risen at a slightly higher-than-normal rate during October and November. Slightly lower numbers, healthy packer margins and higher prices should take care of that problem. 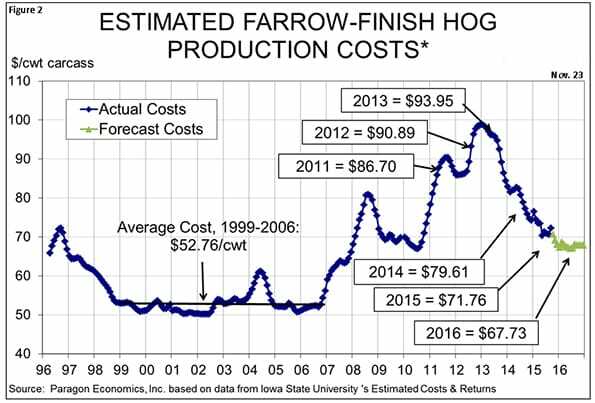 I expect hog prices to rally between now and year’s end but that could get short-circuited pretty quickly if hog producers begin to act like cattle feeders and let these critters get too big. Keep them moving at this time of year! If you need any more incentive, consider this: Christmas and New Year’s Day fall on the dreaded Friday. That means many plants will be down two full days each week and some will be down part of another day on Christmas Eve. If producers are lagging in their marketing chores at all, the situation will be made much worse by this year’s holiday calendar, delaying any rally back to profitable levels. Though losses are substantial at the present time, our saving grace for the coming year will be low costs that continue to decline. As can be seen in Figure 2, our model now puts average costs for next year below $68 for the average producer. The best producers will be in the low-$60s. Corn has bounced (a bit) off its contract-life lows set last week, but soybean meal futures continued to decline, pushing projected costs lower. Two years of bountiful crops would be a great Thanksgiving topic, don’t you think? 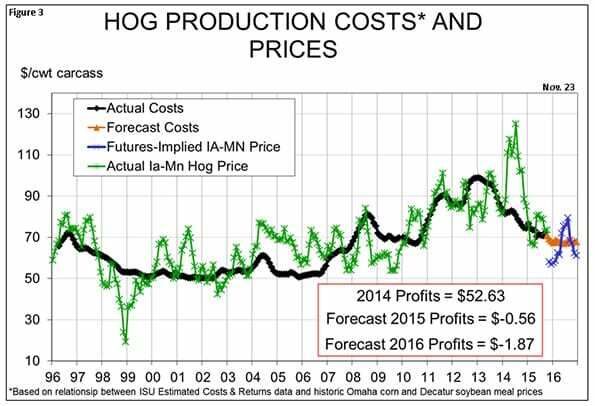 With that said, CME Group corn, soybean meal and lean hogs futures do not paint a pretty picture of 2016 (Figure 3). That average 2016 profit figure was nearly $10 per head just a couple of months ago, though, and I still think we will return to modest profits once the new year arrives.